Lying halfway between Hawaii and New Zealand is Samoa (pop. 189,000; GDP/cap US$1,893). 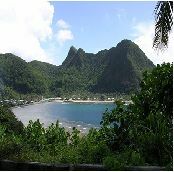 Samoa is composed of nine volcanic islands, two of which, Upolo and Savai'i, comprise 99 percent of the land. Samoa's economy depends mainly on agriculture, fishing, tourism and remittances from Samoans living overseas. Land holding in Samoa can be classified into three categories; customary, freehold, and public. About 81 percent of Samoa?s land is owned by indigenous people in accordance with traditional customs of land tenure. In Samoa, the leaders of the kinship group called the matai are considered as the owners or administrators of the land. The matai holds the land on behalf of all the members of his group. Ownership is settled by a mix of titles and ancestral transfers. Customary land can be leased to foreigners but cannot be bought nor sold except to government for public purposes.